Diva Likes has reached 10,000 fans on facebook and now we have a reason to celebrate! We have no better way to rejoice than sharing some prizes with our lovely readers. 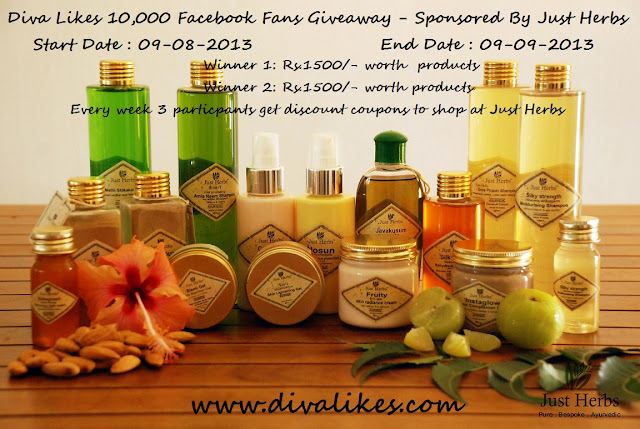 So, here we are with Diva Likes 10,000 Facebook Fans Giveaway and this special giveaway is sponsored by Just Herbs. We would like to thank Just Herbs for this wonderful opportunity. Just Herbs™ is a results-driven line of luxurious pure bespoke and Ayurvedic beauty and Spa products made from wild crafted and certified organic ingredients collected from across India. Just Herbs products focus exclusively on organics, minerals and plant derived materials with life-giving plant waters; and guarantee that all the products from the Just Herbs collection are made with genuinely pure Ayurvedic and organically certified ingredients that have proven therapeutic value for your skin as recorded in the ancient Ayurvedic texts from the Indian sub-continent. In addition to this guarantee, Just Herbs also works diligently to ensure that none of the products contain ingredients such as that are harmful to you or the environment. Just Herbs is luxurious and safe natural-skincare that works! Coming to the giveaway, we will have 2 winners at the end of the giveaway and each will get products worth Rs.1500/- from Just Herbs. In addition to that, every week 3 participants will get discount coupons to shop from Just Herbs. Winners and participants who will be getting weekly discount coupons will be declared via random.org only. Once done, do not forget to leave a comment with the following details. If you fail to leave a comment your entry will not be considered. This giveaway starts on 9th August, 2013 and ends on 9th September, 2013 and is open only for Indian residents. If you have friends/relatives in India you can win one for them too. All we need is a valid Indian address. Now, all you have to do is follow simple rules and leave a comment with details. Participants who won discount vouchers in week 1 are Bhavani Sekar, Angel Walia and Priya Sharma. Participants who won discount vouchers in week 2 are Sayantani Dutta, Megha Jain and Shilpa Bindlish. Participants who won discount vouchers in final week 3 are Punam Gupta, Snigdha Prusti and Sherry Shubhra. Please send your mail address to writetodivalikes@gmail.com so that we can mail you coupon code of 15% discount on your total purchase at Just Herbs. Though you are qualified for discount vouchers you still have an equal chance to win this giveaway. So continue your participation. You have 40 points Punam. Santosh Bangar shared divalikes.com's photo. I guess u have not checked properly ...plz try opening these links once agn on my request and u will find that i have tagged my friends there ..
You have 10 points Aalia. You need to tag 5 friends when you share so that we can consider your points of fb share. You have 10 points Anamika. You need to tag 5 friends for us to consider your fb share entry. You have 20 points Divya. Thanks for the lovely giveaway ! Hope to win and be lucky ! Favorite product from Just Herbs : Youth Antiwrinkle Cream, I have recently started using it and i am in love with it already..it makes my skin so soft and supple and has reduced the fine lines in just 3 weeks. You now have 40 points but please share along with the picture in fb next time. Hi, Its wonderful event and great to see more than 250+ posts with a audience of 10k+. You have 40 points. Good luck! 3. )Just Herbs Product: I am in love with this product because it contains natural ingredients(fruits) which makes skin glowing and radiant..
share the post with friend but don't know how to paste the link here. please accept my participation lavanya. Hi Salma. You can share the link by clicking on the timestamp of your facebook share. You have 120 points now. You have tagged friends in 14 of your shares and not rest. You now have 240 points now. You didnt tag 5 friends meena.